Léargas: Andersonstown Barracks Site - Have your say! Andersonstown Barracks Site - Have your say! A public meeting which is being jointly hosted by the West Belfast Partnership Board and PLACE - the Architecture & Built Environment Centre which examines issues relating to; Planning, Landscape, Architecture, Community, Environment - will be held in the Glenowen Inn on Monday 2nd August at 6pm. The public meeting is to conclude consultation about the future development of the Andersonstown Barracks site. Regular readers will know that this blog supports the call for the Andersonstown Barracks site to be turned over to the local community. Thus far the Department of Social Development has resisted this. DSD’s failure to deal with this issue properly and in partnership with the community, means that almost 5 years and half a million pounds of public money have been wasted. 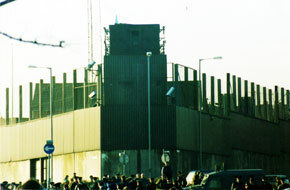 In 2005 the Andersonstown Barracks, after a long campaign, was demolished. Since then the DSD has ignored local representations, including from political representatives, and failed to grasp the opportunity this site offers to enhance the local community. DSD resisted every positive suggestion including the proposal for an effective consultation with local citizens. Two years ago, when local MLA Paul Maskey and this blog met the former Minister for Social Development Margaret Ritchie, we proposed that her Department should support the West Belfast Partnership Board in carrying out a community consultation about the future use of the barracks site. She refused. Instead DSD promoted proposals for residential and intensive commercial development on the barracks site. These were strenuously opposed by the local community. Following intensive lobbying by the residents, community organisations and Sinn Féin a consultation process was eventually begun several months ago under the auspices of the west Belfast Partnership Board and PLACE. The meeting in the Glenowen will be an opportunity for local citizens to express their opinion on the future development of the site and to influence the report which will be produced. DSD should respect the outcome of this consultation. This blog is for a sustainable public service centre on the Andersonstown Barracks site. Maybe you have a different idea? One part of a public service centre could be a new public library for the Andersonstown area . Alongside library services, information and records relating to the nearby cemeteries could be kept in a safe and accessible location for the public. This ought to include the digitalisation of burial records, especially those which relate to the graves of babies and the poor. Many thousands of people visit the cemeteries each year, and many more visit west Belfast because of our rich cultural and political heritage. There should also be a space for local residents to gather and hold community events. These are component parts of a public service centre for the barracks site, a hub, an Ionad an Phobail, which would benefit the local community, provide a useful public service and act as a valuable and attractive gateway into the greater Andersonstown area. It is vital that there is total transparency about a design brief and a tendering process for this site. All the submissions should be seen by the local community. Any short-listed options need to be community-proofed in an open way. There is also the important issue of funding for any public service centre on the site. DSD needs to set aside capital funding for this. So, have your say. Be at the Glenowen at 6pm on August 2nd. Of course this is a local issue , a community concern. I do have a interest in understanding in information and library issues. I would think that a good plan , I would think to inclued a Learning center as well.Learning centers, also referred to as “learning stations” as a part of a larger conplex. Good works , Gerry . I quite like it as it is; an empty space. I hope as many local people as possible have their say on what to do there. "Development" is an interesting subject. It seems to me that it's often just a get rich quick scheme for ambitious types in public and private enterprises working together to benefit themselves in exploiting resources and the local community. The system operates in a way that puts profits before people and if sufficent checks and balances aren't in place then it is incumbant on the people to be active concerning all the affairs of state, at local and at wider levels, including national, which is still a difficulty in Ireland due to the constitutional awkwardness around partition. Above all we need to be concerning ourselves with the creation of energy for the production of electricity, through renewable sourcing and truly developmental projects need to reflect this. Electricians, engineers and ecologists can work together to ensure local capability and responsibility in this area and everyone can move to change consumer patterns. It only takes one person to change their behaviour to change the whole system. The primary concern of any contemporary state/nation has to be with the production and storage of electricity. All energy produced goes into the manufacture of electricity. Even nuclear power is only created for the purpose of creating electricity. The focus of good government is on creating electricity with no production costs only a profit from the export of electricity to the international market. With it's renewable energy resource availlability, Ireland is one of a number of new Sauidi Arabias of energy production.